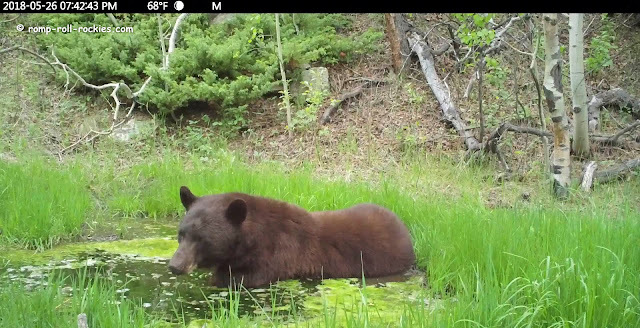 Romping and Rolling in the Rockies: A Bear Pair Make Cubs! 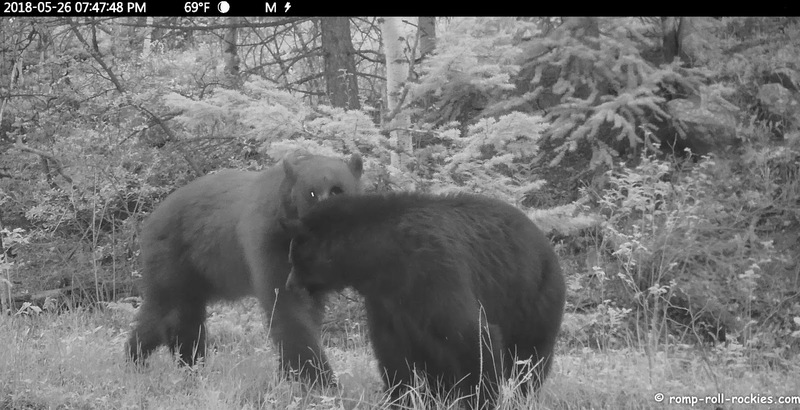 Two trail cameras in one small clearing gave us a sneak peek into the details of bears' lives. I've often alluded to the fact that June is the "mating season" for bears in my locale. Every year, I show you videos of male bears marking trees. Occasionally, I also show you pairs of bears passing a camera together. Never before have my cams captured footage of two bears actually mating. I never expected that the cams would get that sort of footage. 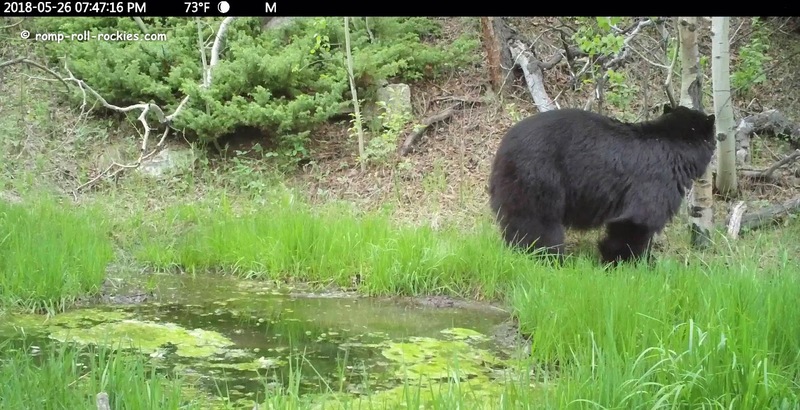 Early this past week, I sleepily pedaled to my main bear cams. I checked them. It started out fairly typically as I watched the footage on the tiny LCD screens of the cams. A male bear entered a clearing and marked a tree. It was a little odd because it's not a tree that bears usually mark... and so my cam wasn't even set up to capture his whole body as he marked. Next, he moved to the main focus of that particular cam and soaked in a water hole for a bit. That's extremely typical behavior. He left the view of the cam. Just a few minutes later, a different bear walked into the clearing and sniffed the tree that the male had just marked. I call her "Mohawk" because she always has a strip of fur puffed up along her spine. She's lived in this area since she was a cub, and this is her first year of participating in the mating season. 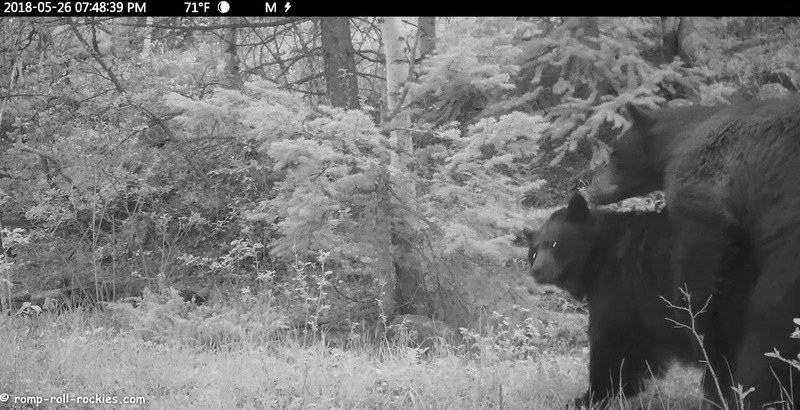 Within seconds, the male bear who had just been in the clearing followed behind her. He was no longer interested in marking the tree or soaking in the puddle. He was on a mission. The next cam is under a canopy of trees so the light was limited close to sunset. Consequently, it shot footage in black and white. The male is the lighter colored bear, and he boldly walked straight up to the female. And I bet that you know what happened next. The female was clearly not certain that she wanted to bear this bear's cubs. She tried to get away and showed him her teeth. They moved out of sight of the cam before too long. A mating pair of bears spend a few days together. Then, both members of the pair start searching for additional mates. A female often has multiple cubs all born within a day of each other and sometimes fathered by different male bears. If a female bear ends mating season with fertilized eggs, they divide only a few times before going into suspended animation until the fall. If the female is fat and healthy when she enters her den for the winter, each fertilized egg implants in the uterine wall and continues developing into a fetus. If the female is not sufficiently healthy, the cluster of cells never implants in the uterus, and the female does not have cubs that year. By that elegant physiological solution, the female's condition when she enters the den dictates whether she'll give birth to cubs that winter. In our area, bears give birth near the end of January, as you saw when I documented a pregnant sow in a den a few years ago. Okay, enough geek-talk. I feel so lucky to have recorded this footage. There is almost no such footage of wild bears in existence so it is unique and extremely valuable in understanding the culmination of mating season. Here is the video. I inserted the notices that "it is for educational purposes only" because I didn't want anyone to get the wrong impression of why I posted it. I am a biologist... and it is very valuable footage in understanding more about bear behavior. You sure know where to place your trail cams! That's amazing. And yes, such helpful information. What a rare treat indeed. What an amazing video and photos. I hope you will be able to document the females progress and see the new cubs in the spring. Thank you for sharing. Best of luck to the maybe-momma bear! How exciting! We hope there will be cubs in January! OMG I have never seen anything like this! I could tell she wasn't pleased and I feel kind of bad for her. That's nature though! I had no idea a female bear had multiple dads to their cubs. Intimacy like we have never seen before!!! Hope there are cubs in the spring, and I agree, can you submit this anywhere? It must surely be a "once in a lifetime" video, thanks for sharing those moments. Gosh, that's incredible footage! Is this near state or federal land? Might determine who would most likely be interested. Given your explanation, could she have mated earlier too? Maybe that's why she wasn't so keen on this new suitor. Fascinating stuff! Bravo. WOW! 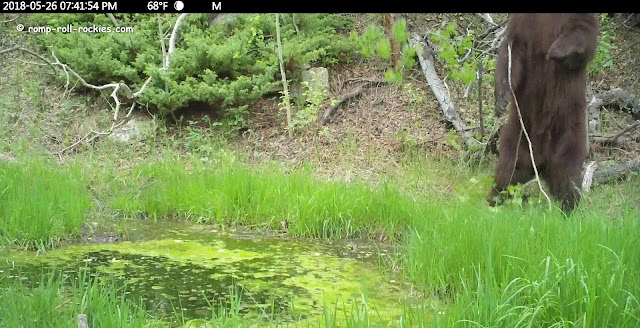 It'll be interesting if the trail cams show her consorting with the same or other males. I agree with Mark Johnson - your trail cam placement is once again excellent! WOW!!! What wonderful footage, and I feel so fortunate I got to see it! I feel I never say how much I appreciate your trail cameras and the time you take to share all these wonderful sightings! Feel free to geek out any time! You must have been so excited when you saw all of this video!!! Now let's all hope we get to see some cubs next year. What an amazing find on your cameras. Thanks for sharing it with us. That is pretty amazing stuff for you to capture. Now to wait and see if any little ones come out of it. Wow! What a lucky find for you! I wonder if this pair will stay together for a few days, since she clearly wasn't eager to mate with him. Delayed implantation is a fascinating ability. Sea otters and some pinnipeds do that too. I really enjoy the "geek talk". I have captured lizards, butterflies and raccoons but not bears. never even seen a bear of course. this is just way cool... love it.... so was the info.... much like dogs I think. Thank you for sharing all that with us - it was so interesting? 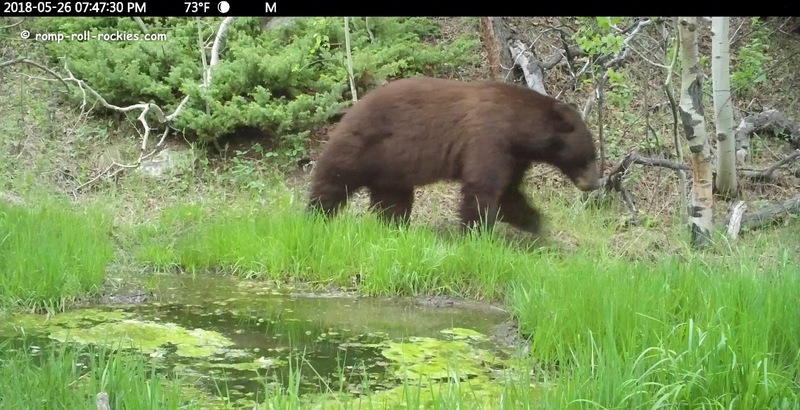 I had no idea bears would mate this time of year, and not have their cubs until next January!